Walkers take a break beside the Upper Lake in Glendalough. 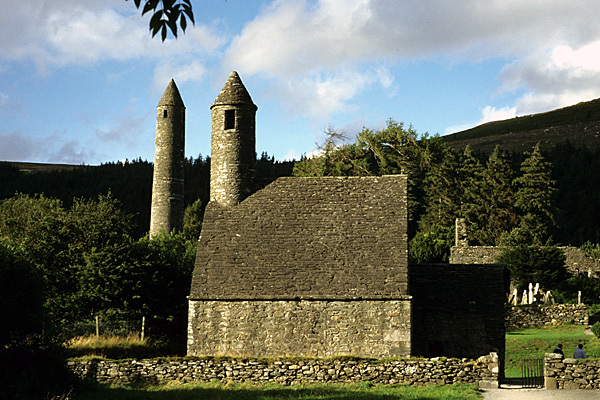 St Kevin’s Kitchen is one of several monastic ruins around Glendalough. 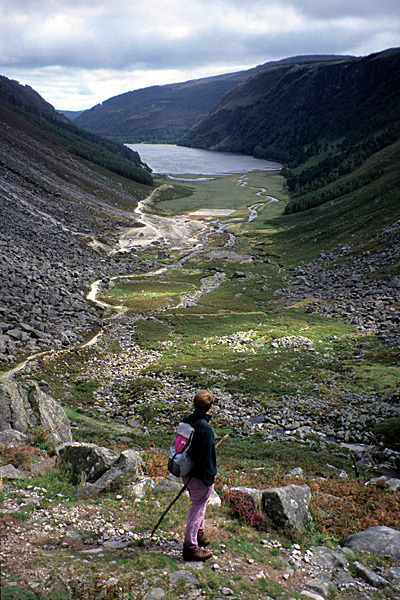 A walker stands high in Glendalough, looking back to the Upper Lake. Frank Greally discussed the idea of publishing this book with the Glendalough Tourist Association, to present a series of walks to visitors in one of the most popular outdoor locations in Ireland. A week of walking was all it took to check the routes, and almost all the distance had been covered in several earlier visits to the area. The local walking guide, Christopher Stacey, looked over the plan of the routes and came on one of the walks. Waterford Crystal provided a measure of funding for the publication and in due course it was printed and ready for distribution. To see whole bundles of 50 copies at a time being snapped up for sale at outlets all through Glendalough was quite surprising, but it seems the market was ready for a one-off publication such as this. In a review in TGO (The Great Outdoors) magazine, Joss Lynam said, "The walks are meticulously described... with its photographs depicting the lakes, waterfalls, crags and rounded granite domes... a very good introduction to this wonderful part of Wild Wicklow"
A great pity the book was never reprinted, but occasionally a copy is available through Amazon.